The Delhi High Court on Thursday asked the Jawaharlal Nehru University (JNU) to admit a student, who had complained of caste discrimination, to the course of his choice. Justice S. Ravindra Bhat also imposed a fine of Rs 25,000 on the university, which will be paid to the petitioner, Amritashva Kamal, within two weeks. The Delhi High Court today dismissed the petition of Ashok Malhotra, the prime accused in a multi-million-rupee land scam, who alleged that the Central Bureau of Investigation (CBI) had illegally detained him. A bench comprising Justices Mukul Mudgal and Reva Khetrapal dismissed the petition, which stated he had already been in judicial custody for the maximum permissible limit of 90 days. The Red Fort was formally accorded the status of a world heritage site on Thursday, making Delhi the only place in the country with three world heritage sites. The other two monuments in the coveted list from the national capital include Humayun’s Tomb and Qutub Minar. India is among the bottom five countries in South and West Asia, when it comes to female literacy rate, says a new report released by the United Nations Educational, Scientific, Cultural Organisation (UNESCO). It is goodbye for Appu Ghar, India’s first amusement park, in the heart of the national Capital whose roller coaster rides and eats have given fun-filled moments to children and adults alike over the years. The Rotary International today announced its partnership with the Bill and Melinda Gates Foundation to eradicate polio. In a major initiative to generate awareness about HIV/AIDS among migrant workers engaged in its project, the Delhi Metro Rail Corporation (DMRC) has taken up a two-year campaign to educate this vulnerable group about the killer disease. The Delhi High Court has issued notice to the state government on a public suit seeking phasing out of commercial vehicles, more than 15 years old, from the Capital’s roads, in compliance with the Supreme Court orders, today. Delhi’s new chief secretary Rakesh Mehta who has taken over charge from his predecessor R. Narayanswami today underlined his priorities for the betterment of the city as well as for improving the governance. His topmost priority is the development of city infrastructure in preparation for the Commonwealth Games (CWG) 2010. This includes the “hard” infrastructure of roads, bridges, flyovers, stadia, etc. A special court of electricity, Patparganj yesterday remanded Munnabhai Battiwala, an illegal electricity contractor, to 14 days judicial custody, for stealing a whopping 552 KW of electricity. A man, his son and daughter-in-law have cheated an NRI of Rs 3.48 crore. A relative of the NRI has lodged a fraud case with the sector 20 police here against the three. One of them was arrested on Wednesday. The first-ever SAARC bands festival got underway here at the picturesque Central Park of Connaught Place with external affairs minister Pranab Mukherjee inaugurating it in the presence of chairman, ICCR, Dr Karan Singh. Minister of state for science and technology Kapil Sibal assured today that the Capital would receive the Delhi State Spatial Data Infrastructure (DSSDI) project by February 2009. Winter break may well help stave off the dreaded “exam ka bhoot” syndrome and provide the much-needed respite from exam-related stress. This is the conclusion of a large number of experts working with school-going children. The three-day annual cultural festival of the Indian Institute of Planning and Management, ‘A-Maze 2007’, concluded at its Satbari campus yesterday with foot-tapping music from some of the participants. The Delhi High Court on Thursday asked the Jawaharlal Nehru University (JNU) to admit a student, who had complained of caste discrimination, to the course of his choice. Justice S. Ravindra Bhat also imposed a fine of Rs 25,000 on the university, which will be paid to the petitioner, Amritashva Kamal, within two weeks. “The university is directed to offer the petitioner a seat according to his choice in the reserved/Scheduled Caste category and admit him to the course of his choice. The university shall bear the costs of these proceedings,” the court said in its order. The petitioner had said that his brother Saurabh Kamal was constantly being humiliated and harassed on caste lines by a group of students, including Mahinder Kumar Chauhan, a former student of the university, who apparently was staying in a JNU hostel. When the two brothers asked Chauhan not to harass them, he reportedly abused and assaulted them. An inquiry conducted by a university committee found Chauhan and others guilty. Chauhan was barred from entering the JNU campus and also from taking admission in the university in future. But, at the same time, the chief proctor passed an order declaring that the campus would also be out of bounds for the petitioner and he would not be allowed to take admission here. The court observed that the said order was in violation of principles of natural justice. The Delhi High Court today dismissed the petition of Ashok Malhotra, the prime accused in a multi-million-rupee land scam, who alleged that the Central Bureau of Investigation (CBI) had illegally detained him. A bench comprising Justices Mukul Mudgal and Reva Khetrapal dismissed the petition, which stated he had already been in judicial custody for the maximum permissible limit of 90 days. A lower court remanded Malhotra and seven others involved in the scam to judicial custody till December 13, soon after they surrendered before the court on the expiry of their interim bail on November 23. The high court on Wednesday reserved the lower court’s order. The Red Fort was formally accorded the status of a world heritage site on Thursday, making Delhi the only place in the country with three world heritage sites. The other two monuments in the coveted list from the national capital include Humayun’s Tomb and Qutub Minar. The status was accorded here at a ceremony organised by director-general of Unesco Koochiro Matsuura in front of the Diwan-i-Khas here. That the Red Fort has long been a witness to ‘trysts with destiny’ of the country needs no mention. However, its universal value as a cultural property has earned it a coveted status. For practical purposes, the inscription of the Red Fort on the world heritage list does not provide it with any extra formal international legal protection. However, it does place an obligation on the Archaeological Survey of India (ASI) to provide careful protection and management of the site, to prevent any further damage to the built fabric and historic gardens in the fort and its setting and to ensure its survival for future generations. The monument bears testimony to Mughal architecture built upon local traditions but enlivened with imported ideas, techniques, craftsmanship and designs to provide a fusion of Islamic, Persian, Timurid and Hindu traditions. Though first referred for an inscription on the World Heritage List in 1992, it was deferred due to the multi-administrative control of the Red Fort. The nomination was however, re-submitted by the ASI to Unesco in 2006.
the nomination of the Red Fort complex, for inscription on the World Heritage List. With a mere 47.8 per cent female literacy rate, India sits at the bottom fifth position with countries like Pakistan, Nepal, Bangladesh and Afghanistan at more dismal positions. According to the data presented in the report for the period between 1995-2005, Bangladesh’s female literacy rate is 40.8 per cent, Pakistan’s is 35.4 per cent, Nepal’s is 34.9, and Afghanistan’s female literacy rate is just 12.6 per cent. Also, less than 60 per cent of the total adult population of South and West Asia can read and write. The report titled ‘Education for all by 2015. Will we make it?’ was released on Thursday at the global literacy meet organised by the UNESCO and the ministry of human resource development (HRD). The report says that India, Nigeria and Pakistan account for 27 per cent of the children in the world, who are not enrolled in schools. India’s education satellite Edusat, devoted to distance learning courses, is one of the saving graces in the face of a poor education scenario in this part of the world, the report says. The Supreme Court on Friday said the land of the park, located in the court’s vicinity, was to be handed over the apex court and to Delhi Metro. A bench of Justice Arijit Pasayat and Justice Aftab Alam ordered the union urban development ministry to hand over the possession of nearly 15 acres of the Appu Ghar land to the apex court authorities and Delhi Metro Railway Corporation. The bench ordered that the land be handed over after evicting its present occupier, albeit illegal, private firm Indian Amusement Limited (IAL), which runs the amusement park that has become a landmark in the Capital. It was the ministry that sounded the first death-knell for the park by allocating the land to the court for its expansion, and also for a separate administrative block and a record room for itself. A part of the land, 6,202 sq. metres, is to go to DMRC to build its railway tracks and stations. The court also ordered the estate officer of the urban development ministry to dispose of a bunch of petitions by various arbitration parties, including IAL, DMRC and India Trade Promotion Organisation (ITPO), by the next date of hearing, February 19. Appu Ghar has had a chequered history since its inception in 1984. The ITPO, after its creation in 1976 for organising national and international trade fairs and exhibitions, was allocated a large chunk of land by the union government on lease near the Supreme Court on Mathura Road. The land was developed by ITPO into what is known today as Pragati Maidan. ITPO in turn subleased 14.74 acres of land to IAL for three years in 1984 to run and operate Appu Ghar. While IAL developed Appu Ghar, the ITPO kept on extending the lease period to IAL till November 1999, when it last expired. When ITPO asked IAL to vacate the land in 1999, the private firm sought legal rbitration with ITPO to continue with Appu Ghar. It has received a grant of $100 lakh from the Gates Foundation to fund societies involved in the anti-polio campaign. “The dedication of the Rotary members has played a vital role in bringing polio to the brink of eradication,” says Bill Gates, co-chairperson of the Bill and Melinda Gates Foundation. “Eradicating polio will be one of the most significant public health accomplishments and we are committed to reach that goal,” a press release said. The polio eradication grant is one of the largest grants ever given by Gates Foundation. The HIV/AIDS mitigation programme, which will target 6,000 workers, aims to increase awareness level and improve their behaviour, attitude and practices. The programme will be taken up at construction sites and worker camps along 13 corridors of Phase - II of the Delhi Metro. The campaign will start in December and will continue till January 2010. The Voluntary Health Association of India (VHAI), an NGO, will implement the programme. With this programme, the DMRC hopes to benefit workers, who come to the Capital from various states of the country. DMRC spokesperson Anuj Dayal said that street plays, puppet shows, films and small group sessions would be organised on Sundays and holidays at various sites, as part of the campaign. Posters, pamphlets, calendars containing basic information on Acquired Immune Deficiency Syndrome (AIDS) and Human Immunodeficiency Virus (HIV) will be distributed among workers. They would also be informed about counselling centres and condom availability outlets in the city. There would be one educator for every 100 workers. The educator will be selected from among the workers. The educators would be trained so that they could educate their colleagues. The DMRC and contractors’ staff would also be sensitised on various aspects of the campaign. A technical advisory committee comprising officials of the DMRC, Delhi State AIDS Control Society, International Labour Organisation, Japan Bank for International Co-operation and general consultants of the DMRC would monitor the activities and provide necessary technical inputs and direction to the programme. Dayal said that the DMRC had carried out an HIV/AIDS awareness programme during the construction of its Phase - I that benefited over 3,000 migrant workers. A division bench headed by Chief Justice M.K. Sarma fixed December 5 for hearing the case, after the petitioner submitted additional documents and government policy. The petition filed by advocate Sugriv Dubey stated that the directorate of transport, flouting the Supreme Court directives of 1998, has issued a circular to allow 15-year-old commercial vehicles to ply on roads as Radio Taxis provided, they were fitted with gas (CNG) kits. The Supreme Court had directed phasing out such commercial vehicles by December 2000. But, due to the inefficiency of the authorities, many vehicles were still plying, said the petition. “The engines are not efficient, the body and doors create noise pollution in the city,” the petition read. Despite the permissible limit of noise being at 0.45 decibel, the city noise level was 12 to 14 decibel. These vehicles were the main culprits of noise pollution in the city, said Dubey in his petition. Delhi’s new chief secretary Rakesh Mehta who has taken over charge from his predecessor R. Narayanswami today underlined his priorities for the betterment of the city as well as for improving the governance. His topmost priority is the development of city infrastructure in preparation for the Commonwealth Games (CWG) 2010. This includes the “hard” infrastructure of roads, bridges, flyovers, stadia, etc. Work also needs to be put apace on the “soft” infrastructure like tourism promotion areas, heritage city promotion, sprucing up the city for the Games. Creating awareness among citizens about the Games, promoting bed and breakfast scheme, cultural activities, etc. Addressing the media after taking charge from his predecessor, Mehta said that preparation for CWG was appreciated by the Commonwealth Federation. Still this is a challenge because Delhi is a megacity and foreigners and other tourists will come during the Games. The city should be developed in such a way so that tourists carry a high opinion of the national Capital of the country. Public transport is another issue that he has taken on top priority due to the increasing traffic congestion and long-term solutions need to be explored. Delhi has 40 lakh vehicles and its roads are spacious enough to accommodate them. Apart from this, lakhs of vehicles of neighbouring states are driven on Delhi roads. To reduce the number of private vehicles, improving public transport is the need of the hour, Mehta stated. The new chief secretary who has also worked as Municipal Commissioner in Delhi stated that High Capacity Bus Service (HCBS) corridor should be monitored closely and its implementation should not be hijacked by vested interests. Penetration of Information Technology for providing services to citizens needs to be speeded up and widened. A timebound plan would be reviewed from time to time. Besides, issues of environment and climate change have become important in the emergence of Delhi as a global city. Earlier, he was caught on December 21, 2006, for stealing and illegally distributing 552 KW of power to the residents of Janta Mazdoor Colony, Welcome in East Delhi. It was learnt that the unauthorised contractor had distributed electricity to around 230 dwellings in the area. Subsequently, a penalty of over Rs 94 lakh was imposed on him, as per the provisions of the Indian Electricity Act - 2003. When he failed to deposit the amount in the stipulated timeframe, he was arrested and produced before the special court. In another such case, the BSES enforcement teams had caught contractor Tej Pal, responsible for erecting the marriage pandal, when they raided a marriage pandal near Handa School, Bhola Nath Nagar in East Delhi on December 14, 2006. It was found that Tej Pal had stolen over 30 KW of power by hooking from BSES’ LV Mains. He was penalised as per the provisions of the Indian Electricity Act, 2003. When he failed to deposit the amount in the stipulated timeframe, a case was filed in the special court. He has been remanded to seven days judicial custody. According to information available, Sarvjit Lamba, an industrialist in the USA owns three factories there. One Nageshwer Prasad of Shivalk Park, Malviya Nagar, Delhi, had contacted him about two years ago and offered to set up a company in Noida in partnership with him. Lamba had invested about Rs 3.50 crore in this factory but Nageshwer changed the name of the Noida factory established in A-51 Sector-8 Noida from Gifts India.Com to Gifts India with 32.47 % share in the name of Sarvjit Lamba. Nageshwer, his son Rohit and daughter-in-law Jaya were jointly managing the Noida factory, it is learnt. After some time, Nageshwer told Sarvjit on phone that the company was running into huge losses and is on the brink of closure. Actually Nageshwer was running the business in his own name by manipulating the documents. He had also given the second floor of the factory on a monthly rent of Rs 7 lakh to a company by name of Birla Soft. After this when Lamba sent his relative, Joginder Singh Sethi to the company to check up the position, the real position came out. Sethi has lodged a case of cheating and fraud in Sector-20 police station against the three cheats– Nageshwer, his son and daughter-in-law. On Wednesday police arrested Nageshwer’s son, Rohit after investigations. Nageshwer and his daughter-in-law are absconding, police said. The three-day musical extravaganza will see some of the top fusion bands of the region perform here. It will also be for the first time that so many of the SAARC countries would be playing together on one stage over three days. The festival, which is open to the public and begins every day at 4 pm, was started with a scintillating performance from the city’s very own band Advaita. A performance that was at par with the other top bands which would be playing here. The highlight of the first day of the festival, which has been organized by the ministry of external affairs in conjunction with ICCR and Seher, was of course the performance by the big band from Pakistan, Strings. The other interesting aspect of the first day was the performance by the Bangla Fusion band. The fusion of Bangla songs with the rock music was specially exciting. The fourth band to take away the heart of Delhites, who gathered in large numbers at the Central Park, was the Soulmate from Shillong. 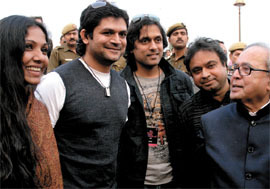 However, the highlight of the festival would be the finale on Sunday which would have the famed trio of India, Shankar, Ehsan, Loy singing for almost two hours at the Central Park. 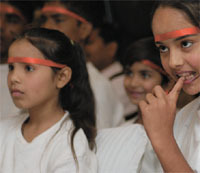 The festival has been conceptualized by India, which is chairing the SAARC this year. It is part of the SAARC cultural festival. The other features of this would a SAARC dance festival and also a SAARC food festival. The festival is also seeing for the first time the participation of band from Afghanistan. It would be the first time ever after the overthrowing of the Taliban regime in Afghanistan that a rock band from that country would be travelling abroad for a performance. The Aryan Band was formed by a group of students studying in exile in Tehran University. But now they have gone back to Afghanistan and have been playing music all over the country. Besides, they are also concentrating on mixing thetraditional Pushto folk music, which the present-day generation in Afghanistan has forgotten, with the rock music to arrange a totally different kind of music. Each evening of the three-day festival would comprise four-five bands with a 60-90 minutes slot dedicated to every band. While showcasing some of the biggest names in the Indian subcontinent, the festival is also a great opportunity for some upcoming young bands to get exposure. It would not only help in detecting illegal constructions, but also help in monitoring the changes that take place in respect of land and buildings. “We started with a pilot project in the Chandni Chowk area.” He elaborated that with the help of the technology used in the project, issues like unauthorised construction, power pilfering, leakage in water system and traffic congestion would be known, immediately. “We have started with Delhi, but we are in touch with the Chief Ministers of other states. If they express their willingness, we will implement the project in their states too. Punjab Chief Minister Parkash Singh Badal has already expressed his keenness about it,” he informed. Stress may take a backseat if students spend their winters creatively and meaningfully, so feel experts. Forthcoming winter breaks and the spirit of the new season can ease out the stress factor significantly before they face the all important end-of-school examinations. The holiday season is ideal for self-reflection. A lot of students are not motivated when they are pressurized, so a long break can act as a re-fueler before they gear up for the final countdown. With few months left for most crucial examinations to begin, (CBSE, ICSE AND X STD), many students find themselves weighed down by expectations, especially the ‘exam ka bhoot’ syndrome. Comparisons and peer pressure are major concerns for students attempting their board exams. These concerns bog students down, leading to severe examination stress and cases of suicide. Competition has never been fiercer—some say the pressure is far greater than it used to be. It cannot be healthy when stress affects concentration, ability to study, even sleep. Exam stress may not be a disease in itself but all studies have shown high levels of stress are counterproductive. Just like exams, stress too can be measured on a scale. It is found that levels of stress during holidays fall under the ‘optimum’ category and best suits the pschological requirements of that time. The grand finale of the festival was the rock show in which bands like Parikrama, Air Supply, Strings, Euphoria and JAL played to the delight of the students from most of the Delhi University colleges. Prof. Arindam Chaudhari, Dean, IIPM, said that it was a delight to host such a show and it was the endeavour of all at the IIPM to present the best.